Excessive dietary energy intake is believed to be the cause of fatty liver hemorrhagic syndrome. Heredity may also play a role, but it is not the entire cause for the disease. Birds housed in cages will more likely be affected because they are unable to exercise to burn off the extra dietary energy. Walking hens are less likely to develop this problem. The disease is observed most often in birds that appear to be healthy and in a state of high egg production. As a result, death can occur quite unexpectedly. Affected birds are usually overweight and may also have pale combs. Generally, however, the disease has few or no symptoms prior to the bird's death. The use of L-Tryptophan in the diet can decrease the syndrome. 1 2 3 "Miscellaneous Management Related Diseases," Cooperative Extension Service: Mississippi State University. Retrieved from Msstate.edu on 2007-03-11. 1 2 "Fatty Liver Syndrome: Introduction," Merck Veterinary Manual Online, 8th Edition, 2003. Retrieved from Merckvetmanual.com on 2007-03-10. 1 2 3 4 5 "Poultry: Causes for Fatty Liver Hemorrhagic Syndrome," Mississippi State University Extension Service. Retrieved from Msucares.com on 2007-03-11. ↑ Cherian, G, "Fatty Liver Hemorrhagic Syndrome in Laying Hens: An Investigation into the Role of Dietary Fatty Acids," USDA Current Research Information System (CRIS). 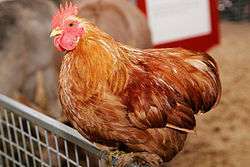 ↑ "Death Occurring In Fowl," GameRooster.Com Disease Diagnostics Aid. Retrieved from Gamerooster.com on 2007-03-11. ↑ Y. Akiba et al, L-Tryptophan alleviates fatty liver and modifies hepatic microsomal mixed function oxidase in laying hens, 1992, Comp. Biochem. Physiol. Vol 102A, N°4, pp 769-774. This article is issued from Wikipedia - version of the 3/16/2013. The text is available under the Creative Commons Attribution/Share Alike but additional terms may apply for the media files.